On December 6, 1992, a large crowd of Hindu Kar Sevaks demolished the Babri Masjid in Ayodhya, Uttar Pradesh. The demolition occurred after a political rally at the site turned violent. The Vishva Hindu Parishad (VHP) and the Bharatiya Janata Party (BJP) organized a rally at the site involving 150,000 volunteers, known as 'kar sevaks'. The rally turned violent, and the crowd overwhelmed security forces and tore down the mosque. A subsequent inquiry into the incident found 68 people responsible for the demolition, including several leaders of the BJP and the VHP. The demolition also resulted in several months of inter-communal rioting between India's Hindu and Muslim communities, causing the death of at least 2,000 people. There were two sets of cases relating to the Babri Masjid demolition. The first involved unnamed 'karsevaks', the trial of which is taking place in a Lucknow court, while the second set of cases relate to the BJP leaders, including LK Advani, Murli Manohar Joshi, and Uma Bharti, in a Raebareli court. The CBI had charge-sheeted Advani and 20 others under Sections 153A (promoting enmity between classes), 153B (imputations, assertions prejudicial to national integration) and 505 (false statements, rumors etc. circulated with the intent to cause mutiny or disturb public peace) of the Indian Penal Code (IPC). April 6, 2017: The Supreme Court indicated that it will use its extraordinary powers under Article 142 of the Constitution to transfer the Babri Masjid demolition related trial in Rae Bareilly against top BJP leaders L.K. Advani and Murli Manohar Joshi to Lucknow, where a CBI court is hearing conspiracy and other serious criminal charges against "lakhs of unknown kar sevaks" for the actual act of razing down the 15th century mosque. March 6, 2017: Supreme Court indicates it may revive conspiracy charge and order a joint trial of crimes 197 and 198. February 2011: CBI moves Supreme Court. Argues that "the actual demolition of the Babri Masjid and the continuous assault on media persons form a single connected transaction and can well be a concerted conspiracy". May 4, 2001: Special Judge S.K. Shukla drops a conspiracy charge against 13 accused, including Advani and Kalyan Singh. Bifurcates Crimes 197 and 198.Allahabad HC upholds May 4, 2001, special court order, dismisses the CBI's revision petition for a direction to proceed with the conspiracy charge against Advani and others. 1993: Govt. takes over 67 acres of land around the area, seeks SC's opinion on whether there existed a Hindu place of worship before the structure was built. December 1992: Babri Masjid demolished by a frenzied mob of karsevaks. 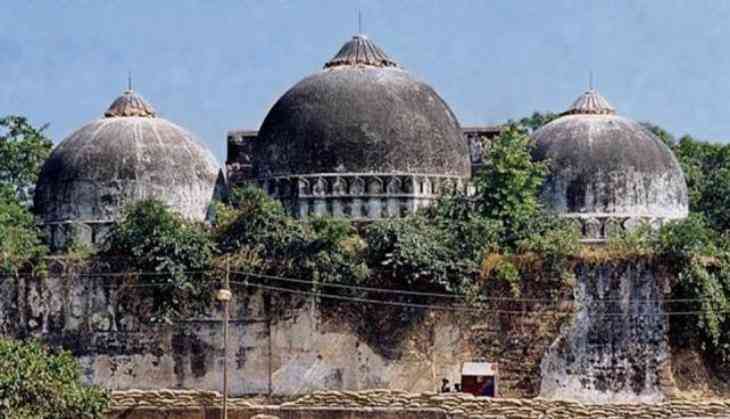 Two FIRs filed in the Babri Masjid demolition case. Crime no. 197 deals with actual "demolition of the mosque by karsevaks." Crime no. 198 named L.K. Advani, Murli Manohar Joshi, and others for 'communal' speeches before the demolition. 1991: U.P. govt. acquires land around the structure for the convenience of devotees who attend Ram Lalla darshan. 1986: District judge orders locks be removed. The site opened for Hindu worshippers. 1959: Nirmohi Akhara files the third suit, seeking direction to hand over charge of the disputed site. U.P. Sunni Central Wakf Board files fourth suit in 1961 for declaration and possession and fifth in 1989 in the name of Ram Lalla Virajman for declaration and possession. 1950: Paramahansa Ramachandra Das files a suit for the continuation of pooja and keeping idols in the structure.